Essex Police and Essex County Fire & Rescue Service are working together to help make a difference in local communities, helping people to live & feel safer. 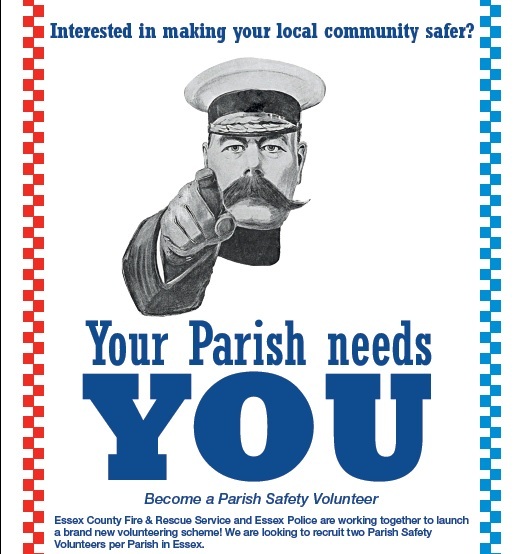 They are launching a brand new volunteer scheme and are looking to recruit two Parish Safety Volunteers per Parish in Essex, tasked with arranging and conducting home safety visits. These volunteers will deliver crucial fire and crime prevention advice, extensive knowledge of local support services and the ability to fit smoke detectors directly into the homes of those most in need. If you’re interested, you’ll need to apply for interview and be required to undertake Essex Police vetting. You will receive comprehensive training from both Essex County Fire and Rescue Service and Essex Police, a full uniform and all equipment required to carry out the role. To ensure volunteers are well supported, Parish Safety Volunteers from across the county will be invited to on-going training and networking opportunities throughout the year. 1. What is the purpose of the Parish Safety Volunteer Scheme? Reducing accidental dwelling fires in the parishes in which Parish Safety Volunteers operate. Reducing burglaries in the parishes in which Parish Safety Volunteers operate. Making people feel safer in the parishes in which Parish Safety Volunteers operate. 2. Why are Essex Police and Essex County Fire and Rescue Service working together on this? Essex County Fire and Rescue Service alongside Essex Police have a joint desire to increase community resilience and support the building of stronger communities in Essex. 2. What will Parish Safety Volunteers deliver in their Parishes? Conduct Parish Safety Visits and deliver Essex Police and Essex County Fire and Rescue Service approved advice and support. Have a comprehensive understanding of what support is already offered in the Parish and be able to signpost accordingly. Be able to fit smoke detectors in the homes of local residents. Participate in activities in order to generate Parish Safety Visits and promote awareness of the scheme in their Parish. 4. What else will Parish Safety Volunteers be expected to do whilst volunteering? Liaise with Essex County Fire and Rescue Service in order to arrange visits and confirm volunteering availability. Keep and maintain the Parish Safety Volunteer equipment provided by Essex Police and Essex County Fire and Rescue Service. Complete the paperwork required of Parish Safety Volunteers and return it within the agreed timeframe. Adhere to the policies, expectations and procedures required by Essex County Fire and Rescue Service and Essex Police at all times. 5. How will Parish Safety Volunteers find individuals requiring a visit? Referrals will be generated by Essex County Fire and Rescue Service and Essex Police, through the processes already used by the organisations to arrange home safety visits. Referrals will also be generated by Parish Safety Volunteers themselves, as they will be promoting the service and already have some local knowledge of areas and individuals that would benefit from a PSV visit. 6. How will Parish Safety Volunteers interact with the Parish Council? Parish Safety Volunteers will not require co-ordination or management from Parish Councils as Essex County Fire and Rescue Service will provide all support needed. However, we will set up a direct line of communication between Parish Safety Volunteers and Parish Councils. This could mean that volunteers attend Parish Council Meetings to update on progress and activity. It could also mean a telephone or email update from volunteers. This will be a local arrangement tailored to the needs of the Parish Council in question and established when the scheme is introduced to the Parish. 7. How will Essex County Fire and Rescue Service and Essex Police keep Parish Councils updated on the PSV Scheme? ECFRS will send a bi-monthly progress update to all Parish Councils for whom the Parish Safety Co-ordinator holds contact details. This will be sent on approximately the final day of the month. 8. How will we know what impact the Parish Safety Volunteers have on their Parish? The Parish Safety Volunteer Co-ordinator will carry out a robust evaluation of the PSV scheme. This will be completed in by October 2016. Parish Safety Volunteer Co-ordinator: Essex County Fire and Rescue Service – Kieron Moir. Please complete an application form, or get in touch using [email protected]. The Parish Council would like to encourage volunteers to come forward to help operate a Speedwatch service. This involves occasional operation by the roadside of an electronic piece of kit to note the speeds being clocked up by vehicles on our roads. The object is to remind drivers that there are speed limits and that they should be obeying them although there is an escalation process above the volunteer level which takes a stronger line with serious and/or repeat offenders. 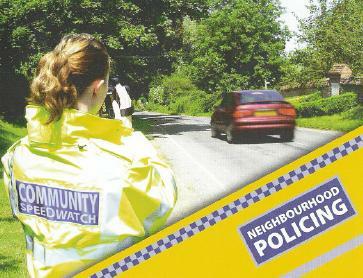 Speedwatch volunteers operate in pairs and full training is given by the Police. Some villages arrange swaps so that you don’t end up recording the speeds of your immediate neighbours. If you think this might be for you please contact Sue Pullen on 01206 735 367 or [email protected] for further information.